Cover Reveal! 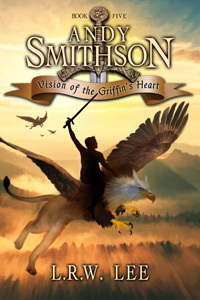 Hot off my cover designer’s desk, the cover for Vision of the Griffin’s Heart, book five in the ongoing Andy Smithson epic fantasy series is here! The scene to be depicted is Andy and up to 12 others riding on the backs of 12 other griffins, flying back to Castle Avalon that is under seige by the 7-headed dragon, Abaddon. The scene in the book takes place at midday so the sun is shining. Oomaldee is still shrouded in fog so you can include clouds if needed. A scene similar to Prisoner of Azkaban might trigger fond memories. My story-griffins have white feathered heads and almond-color fur. Front feet need to be talons and back quarters that of a lion. Unfortunately, I could not find any griffin stock art that would work, so you’ll need to assemble your own griffin. Andy sits just before wings begin. Need silhouette again, at least I think so for consistency, no shield. Again he carries a sword. No armor, just tunic. Andy is now age 14. That input produced this result. Quite snazzy if I say so myself! This book is due out in January 2016. PLEASE NOTE! Sign up to be notified the instant a new post goes live. Scroll back to top of this page and enter your email. The cover looks amazing! Congrats. I love it; the griffin looks wonderful! Can’t wait to read!